The ColorEdge CS240 features a wide-gamut IPS (in-plane switching) with a 1920 x 1200 native resolution and reproduces 99% of the Adobe RGB color space. With this extended gamut, images shot in RAW can be converted to Adobe RGB or images shot in Adobe RGB will be displayed in vibrant and lush colors. An LED backlight reduces power consumption to just 27 watts during typical operation and utilizes brightness modulation technology for flicker-free image display to help prevent eye fatigue. 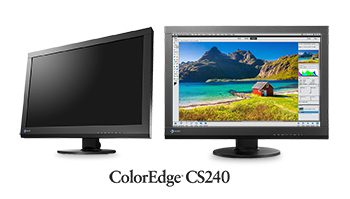 The ColorEdge CS240 is now shipping. Date of availability and price vary so please contact the EIZO subsidiary or sales distributor in your country for details. EIZO will exhibit the ColorEdge CS240 at Photokina in Cologne, Germany from September 16 - 21 in hall 4.1 stand I025 J030.